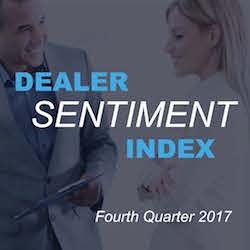 Cox Automotive Dealer Sentiment Index - Fourth Quarter 2017 - Cox Automotive Inc.
U.S-based automobile dealers are optimistic about the first quarter of 2018 and believe inventory issues of earlier this year have mostly subsided, according to insights found in the fourth-quarter Cox Automotive Dealer Sentiment Index. Despite a healthy sales environment during the survey period, both franchise and independent dealers continue to feel pressure to lower prices, experience high costs of running their business, and report weak customer traffic. To see the highlights from the Cox Automotive Dealer Sentiment Index for fourth quarter 2017, download the full report below.